Curb appeal is all about first impressions, whether you’re trying to impress prospective buyers or put a smile on your own face whenever you pull up to your house. A bright fence draws a buyer’s eye and makes your home more appealing. An easy way to add curb appeal to a home is by lining the front with a functional but decorative fence. Beautifully crafted fences are great for keeping out unwanted visitors while keeping children in without hiding the house. A well-chosen fence adds character to your home, along with a sense of security. There’s a reason we all cite the “white picket fence” as the ideal, it adds depth and encloses the yard but also draws the attention of a passersby with its clean lines and classic style. Other styles of fencing are equally attractive depending on the style of the home. Front yard fencing in the form of stone, wrought iron, or a wooden all accomplish the same delineation of property lines and offer a place to anchor shrubs or grow trellising vines. Everyone has heard about the dream of a home with an iconic white picket fence. Somewhere embedded deep in the psyche of the average home buyer is that image of a beautiful house with a picket fence framing the yard. Tapping into that sub-conscious thought is an open doorway to instant curb appeal. 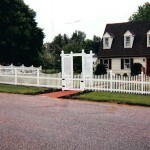 Picket fences may be traditionally white or natural wood, averaging between 2 and 4 feet high. However, a simple change of color might make a more lasting impression on potential buyers. Matching the color of the picket fence to the trim color of your house gives a more visually uniform appearance while implying a certain neatness about the landscaping. Ornamental iron fences add a certain elegance to even the most modest of homes. Ornamental iron fences have been used for centuries by the elite and eccentric. Ornamental iron fences add an air of mystery to the property. Neighborhoods that are steeped in historic heritage often welcome wrought iron fences in traditional black, but for neighbors who are not so mysterious an ornamental iron fence can be painted any color. Houses that have a fair amount of greenery around them benefit from a rich green wrought iron fence that blends well into the landscape but stands out enough to make a statement. Selecting a an ornamental iron fence and its color palette and scroll work should be done with the utmost consideration to keep the house feeling like a home and not like a prison. Split rail fencing gives a home a very country feel. There is an openness about split rails that cannot be found in any other form of fencing. Split rails offer a definitive frame for a home and yard with minimal materials and require the least amount of maintenance. For instance, if a rail is damaged, only that single rail needs replacing, whereas in other fences whole sections may need replacing. This type of fencing lends itself to extreme versatility in the variety of different woods that can be used, the decision to paint the fence or not and the ability to add vines and plant life or leave in its natural state. The price of a fence depends on the customer’s needs. Things that affect the cost of a fence and to take into consideration are height, footage, location of the fence and the fence materials that will be used. There is no equation to figure the coast on an averaged sized backyard. We offer free fencing estimates so that you know what your options are and what it will cost to install your fence. Each customer and the job is unique. We prefer to quote jobs and not to give generic per-foot quotes. Once you have decided to install a fence there are some items you should be prepared to discuss with the estimator: What is the purpose of the fence, what is the exact location of the fence, how high do you want the fence, what style do you want your fence and what material do you want to use on the fence. What is your approximate budget for the fence and when is your desired completion date. If you have the answers to these questions already answered before the estimator arrives things will go much more smoothly and we will be able to give you a very accurate estimate of your desired fence. If you aren’t sure exactly what type of fence you want or have other questions regarding your fence, our estimator will arrive with material samples, photos and other information to help you make a more informed decision on your fence. We are always kind, courteous and conscientious of your needs and desire for your fencing needs and your yard. Decide where the fence will be located in your yard. Determine how much of the yard will be fenced and how much privacy you are looking to gain by adding a fence to your yard. Obtain a copy of the plat for your property. It is very helpful in determining property lines for fence placement. If you do not have a copy with your closing paperwork, you can obtain a copy of the plat map from your local planning office. Check with your HOA. You may not have much of a say in the height or type of fence that you install. Make sure you are within the guidelines of your HOA covenants. Many HOA’s require an approval process before constructing a fence. Decide the need of the fence. Think about what you are looking for in a fence. Is privacy our main concern or is it decoration. How many gates will you need? Do you need walk through or drive through gates? Do you have or will you be getting a pool? If so, additional pool restrictions will apply. Do you have very small pets? If so you may want to consider double pickets if you are interested in aluminum fencing, as this will decrease the spaces between pickets. Do you have a common area or view that you want to keep visible? You might want to have a privacy fence on the front and side with a more open style in the back. Decide on the height of the fence. You may build a 6-ft. high privacy fence only to find that the next-door neighbors can easily see over when they’re lounging on their deck. Or you may find that your 6-ft. tall privacy fence only needed to be 4 ft. tall because surrounding areas slope away from your yard. Either way, you’re wasting materials, money and time building a fence that doesn’t suit your yard. Consider Fence Maintenance. How much time do you want to spend maintaining your fence? Wooden fencing requires the most maintenance but it can making your yard more aesthetically pleasing. Aluminum or vinyl fencing requires little upkeep and makes this option a very appealing on. Pick the design of your fence. A solid, high fence may wall off prying eyes, but it also walls you in. Your fence doesn’t have to be one continuous design, height or even material. Plan to have an entire panel removable. At some point you will probably need to get something big into your backyard. Make sure that one of the panels will be easy to remove or that there is a big enough opening to fit large objects through easily. Many cities require a permit before constructing a fence. Check with your local planning officer or zoning department to determine if you will need a permit to install your fence. You may want to check with your neighbors to see if they might be interested in getting a fence. You can share the cost of the shared side line and save some money. Or, if they already have a fence, get permission to connect to it and save money as well. Keep in mind that the fence price you are quotes is subject to change due to material and fuel costs. The only way to lock in the price is to sign a contract.